This is my personal review (the pros and cons, technical review) of this DVD/HDD recorder I bought in Singapore (read: SE Asian version). Those who are looking to buy it may be disappointed in some areas of this player while it stands out in other areas. Please note that this review concentrates on the bad areas of this player - that everyone should be aware of. Pioneer has made a name for itself in the audio/visual arena for producing quality and reliable products. It has not failed to do the same for this product, but at the cost of many restrictions to provide ultimate stability. Maximum 227 hours Recording (HDD:MN1) (Yep, that's using the lowest quality settings) NOTE: This is from the 80GB version. Both are similar except for this attribute. NOTE: Some countries' models don't have USB support. Powering up the unit, the Initial Setup Wizard automatically fired up. At this screen, the clock settings, PAL/NTSC selection, Power Saving Setup and TV channel setup among the various things. The Timer Recording is amazing! Pioneer must have done extensive testing on its timer feature. It allows up to 32 slots! What's more - I set a timer to record daily from 2155hrs to 0130hrs and that counts as One Slot only! I was under the impression that it will consider it 31 slots, one for each day. The Timer recording is good! Really good! Did I mention that it was very user friendly? To instantly record a show, hit the REC button. To quick set a timer, simply hit the REC button again and it will step up in 30 min increments for up to 6 hours. When recording this way, you can hit the Pause button on the remote to temporarily pause recording - useful to cut out ads, although you can also cut out ads manually after recording. Just hit the REC button to start recording! How simple can it get? Want to make a copy of your birthday or wedding video for someone? No problem - just use the High speed copy feature. The feature copies all the files digitally to the hard disk and burns at high speed to a DVD-R or DVD-RW. It even allows you to burn multiple copies of a single DVD. In addition, if you are copying a DVD or recording a TV Show, you can still play movies from the DVD/hard drive with no lag at all! Talk about multi-tasking! Note that you can not play a DVD when it is being copied at high speed as a DVD does not have random read access like a HDD. 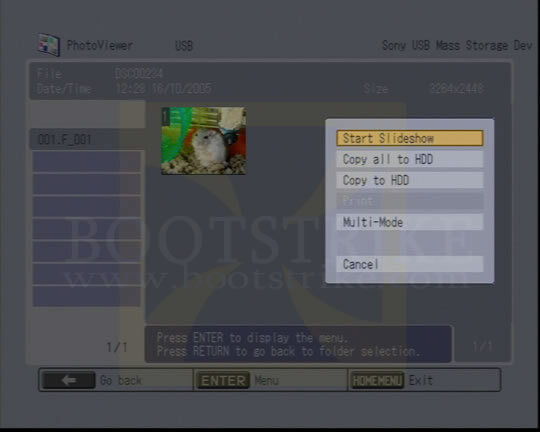 Copying(Disc Back-up) is done in the background and you can still play HDD recorded videos! The unit comes with 2 USB ports. With it, you can connect your camera to quickly showcase your photos in the living room. Want to print them? No problem - copy the photos to the unit's HDD, connect a PictBridge compatible printer to the unit and print away! Almost like a computer desktop. What's more, you can connect an external keyboard to the unit and use it to type titles, although I can not think of a worthwhile reason to do that. And what's even more - connect a card reader and instantly turn it into a Card Reader. This way, you can read your taken photos from any memory card. Title names can be entered for your recordings and it supports Nokia style keypad entry for easy text entry! Enter titles quickly without moving the selection to each letter and entering manually. The remote comes with a thoughtful feature of controlling your TV's volume, channel and input source. This is useful as you only need one remote control to control volume and not hang on to two at the same time. It supports many TVs, including Toshiba, Panasonic and Sony. The unit comes with a easy to use video editor. Using it, you can erase sections of a recorded video (for example, to remove ads). Pioneer has been considerate to provide two modes of editing so that you can burn DVDs compatible with most (if not all) DVD players. What a wealth of edit options! It even has Lock functions to prevent accidental erasure! You can also burn recordings into DVD-R or DVD-RW. This is done in high speed and it is really fast. Using a Copy List, you can select multiple recordings and even create a static menu to showcase them. 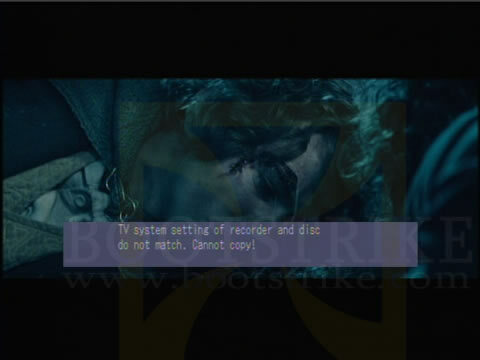 Not only that, you can set chapters in your recordings which can be added to the DVD menus too. The major bad thing about this recorder: It does not support Simultaneous Multi-System playback. While the unit can play NTSC/PAL DVD and you can watch PAL/NTSC TV channels, you cannot record and play different TV systems at the same time. 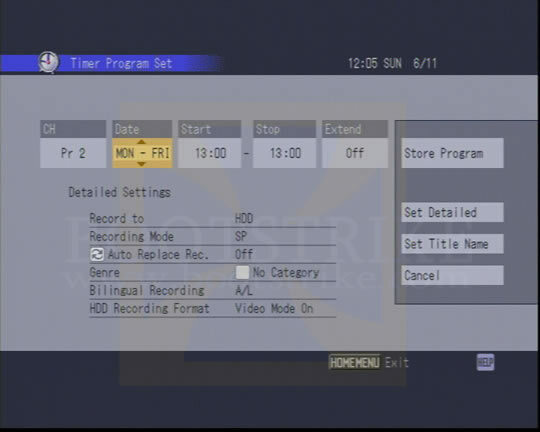 This means that when you are recording a PAL TV Show (the free-to-air television standard used in Singapore), you cannot play any NTSC DVD titles which most DVD movies use. Pioneer is from Japan, where they use NTSC. Probably they were thinking that it is a minor flaw since they have not been in our shoes. I found myself unable to watch movies when recording as it is all in NTSC format. Big mistake Pioneer, Big mistake. You basically can't play any DVD movies when recording TV Shows because the unit can't handle two different TV systems (NTSC and PAL) at once. Next, you can not copy whole non-copyrighted DVD tracks (read: only selected tracks - useful if you want to strip out ads/trailers) at high speed (realtime is possible) to the hard drive for later viewing. First, you can only copy a title. That's all right, we are only after a movie (not the commentary or trailers). However, the videos are copied to the hard drive in real time (1X) and re-encoded to the recording quality you chose (XP, SP, LP, etc). You cannot copy the whole VIDEO_TS/VOBs files to the HDD, Nada, Pioneer wants you to play the whole movie, re encode it (lowering the quality) and play from your hard drive. What's more, while this is done, multi-tasking is effectively disabled - you can't watch any recorded videos or do anything else. One advantage of this, though, is that the copied track can take less space depending on recording quality chosen. OK then, fine. So I decide to copy a NTSC DVD title to the HDD using the stone age way. I play the DVD, set to play Movie and hit the One Touch Copy button. Out came another violet box: Error! 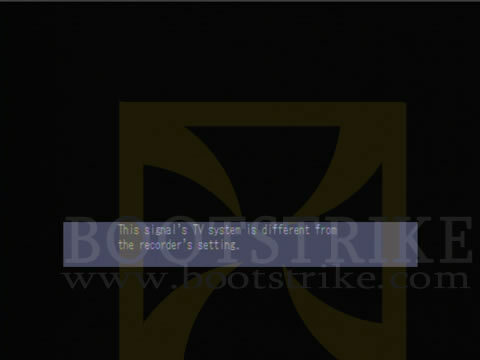 DVD TV System (NTSC) not compatible with current DVD TV Tuner System (PAL)! To fix this, I had to access Initial Setup and change my TV System to NTSC. This shot another error message saying that the TV Tuner System is not compatible with NTSC and outright refused to show the TV signal. The unit could just try to decode it even though it is a different TV System - but it doesn't. My Toshiba TV can show the PAL signal as NTSC with some colour information loss, but it still shows the video. What? - I can't copy a DVD title unless I change my TV Tuner standard to NTSC? OK, our aim was to proceed with the One Touch Copy getting past all hurdles - and it finally complied. I played the title and hit the One touch Copy button. The title restarted from the beginning and I had no control over where to stop and can not pause it. Once I tried stopping it, the whole title was not recorded in the HDD - the unit demands that you play through the entire title to record to HDD. Multi-tasking is disabled - you can't watch any recorded clips. You cannot record sections of a title to the hard drive - but you can erase sections that you don't want after recording. So every time I need to copy NTSC DVD Title, I have to access Initial Setup to set TV Standard to NTSC - a process that was supposed to be one-time, and wait for the whole title to finish recording, up to 3hrs per DVD. Dreaming of using this to convert old VHS tapes to DVDs? Well, dream on. I have some very old VHS tapes, which output decent quality images but have some damaged parts. So I tried to connect up my VHS player to this recorder and record from Line In. What happened was that the unit started shooting "TV System is not compatible with this recorder" errors for the damaged parts where video is still supposed to be visible with minor defects. It refused to record. Make friends with this screen - you'll see it whenever you encounter bad quality video, or attempt to do a DVD title copy to hard drive. Eventually, I managed to get to a clean sable part of the tape where the video started showing through. Immediately I hit the Record button and let it record for a full hour and played it back. What I got was a very bad video - frozen frames, unsynchronised sounds and video fit for the junkyard! Remember, the keyword here is old - I am sure that with tapes that are kept in good conditions, this will not be a problem. This problem also occurs if the RF (TV Tuner) signal is weak. Even though this unit featured a "Nokia Style" Title keypad entry, it wasn't really like that. For example, you would expect "zero" to enter a space (it is actually the pause key, thanks Imitator). Nope. Likewise, you would expect "hex" to change case - Nope. All these functions have to be accessed manually by moving the selection across many buttons. Digital Media Jukebox? Right - so I expect basic functions like copy Mp3 to HDD and rip audio CD to mp3. Like Musicmatch Jukebox. Nope, both are not there. The unit can play Mp3 files from CD but can not copy them to HDD. It can play audio CDs, and rip them, BUT they can only be ripped (or should I say 're-captured') in REALTIME (that's 1X or 60 minutes, ladies and gentlemen) in a WAV-like format to HDD. This means that each CD will take about 700mb of space when 70mb of space is enough (using mp3 encoding)! And no, you can not play DVD-MP3 with this unit. The unit has USB support. Awesome, I thought - I could play/copy Mp3, WMA, MPG and Picture files from there. Wrong! Only the last part is true - you can only access Picture Files. You can copy them to your HDD and burn to DVD but you cannot write it back to the USB drive. There is a built in sort of "non-removable filter" to show only JPG files in the USB drive. You can access photos with a slide show and it'll display them full screen. That's it. Can't access MPG, Mp3 or copy videos to the external drive. The unit features a DVD writer (well, it's a DVD/HDD recorder). Most (if not all) DVD writers support writing CD-R and CD-RW discs. In this unit, I am sure the writer supports such a capability that can be used to write VCDs, audio-cds and data cds (eg. to copy audio/JPGs to CD) - it is just that Pioneer did not enable the firmware with such a feature? Why - could be due to the fact that VCDs are outdated. But they could still let us copy audio cds or burn miniDVDs. On the DVD to DVD copying feature, which is really high speed, a feature that would have been nice is to re-encode a dual-layered DVD to a single-layered DVD, or even to VCD. But complaints aside, the backup copy is a 1:1 exact copy without any quality loss. That's good, and you can write to Dual Layer media too. But note that all copied DVDs in the HDD are not playable until copied to a DVD-R or DVD-RW. 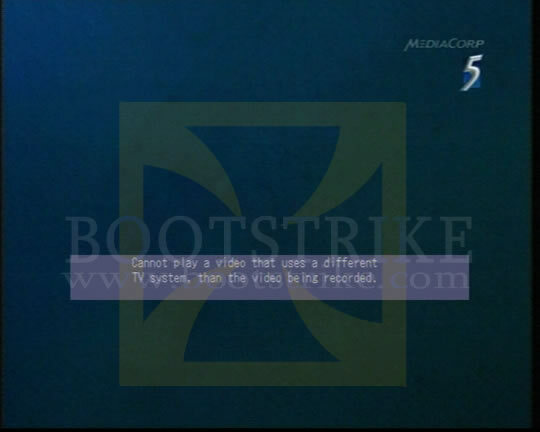 The video is there, right there in the HDD instead of the DVD, but Pioneer refuses to play it till copied to a media. One flaw on the DVD burning feature is that you can't set the recording speed - it is either high speed or 1X. Recording at 1X re-encodes the whole video in realtime while recording at high speed uses the max speed for the DVD-R. So imagine using a 16x media on this writer - it will shoot error messages in the middle of 16x speed burning unless the unit is placed on a very stable surface (have not tried this yet). Wait a minute - Lets zoom into that phrase "Recording at 1X re-encodes the whole video in realtime...". Imagine having a 6 hour video recorded at SP quality. SP is 2 hours per DVD. To copy this video to one DVD, we have to recompress it. That's all right, DVDs don't have unlimited space. The kicker? The unit has to play the whole 6 hours to re-encode the video to record the video to one hour to fit in the DVD. Why has it got to do it in realtime instead of just re-encoding it digitally? What's more, while this is in process, you can not do anything else with the unit, including watching recorded videos. 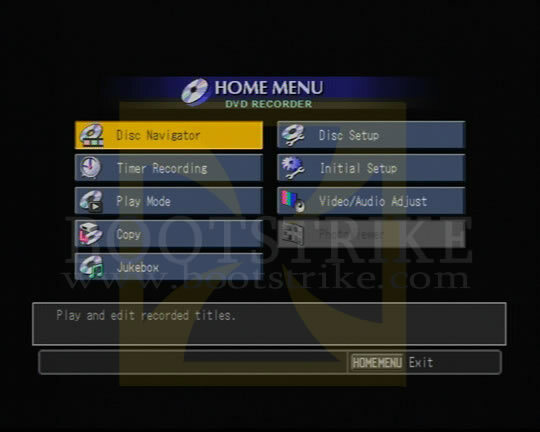 The Copy options screens. Note that you can also record from firewire video sources. Have a widescreen movie that you would like to view in full screen using your 4:3 TV? Yes - you guessed it right - no such feature in this unit. There is a useless "Pan & Scan" option (till now, I do not know what it does) in the Initial Setup, but even with it enabled, the video is still the same. The Pioneer technician officially confirmed with me that I can not zoom in to fill a bigger area of the screen when watching widescreen movies. Stability wise, the unit is very good. However, I have discovered a bug with my unit (don't know if the others have it). If I overrid a recording timer by doing a manual recording, stop the recording and hit the record button again (as I wanted two different files), it will shoot an error message "Cannot record to Hard Drive". I attempted to try other things and ended up with the unit frozen. It refused to obey any remote controller commands or onboard buttons. I had to manual power off the unit and switch it on, after which it says "Operation aborted due to Power Failure". Pioneer uses the same model number for different countries but with different space allocations. This official website in the UK uses DVR-530H-S as the model number, but it features a 160gb hard drive (we have 80gb here). What's more, the upgraded version, the DVR-630H-S, sports not 180, not 200, not 220 - but a whopping 250GB of hard drive space (minus USB support) whereas in Singapore's version of DVR-630H-S, it's only 160gb (with USB support). In summary, be prepared to face with a lot of restrictions on the unit. DVR-530H, DVR-520H, DVR-420H and DVR-633H-S models should have the same defects too, as the technicians I spoke to said that no units in Pioneer have lesser or none defects. But if the defects (or restrictions) are of low priority to you, then it is a very good unit to get - taking into account the stability and user friendliness. Units like the Lite-On LVW-5045, LG units and other models may be better, or have some bugs, but I am sure that there is a better unit out there that has lesser restrictions. The US sibling, DVR-433H-S, DVR-533H-S and DVR-633H-S, has even won cNet's Editor's Pick award, however, I believe the same flaws exist in that recorder too. Still, US uses NTSC so they will face lesser problems than we PAL users do. User comments on the units can be found on US Amazon's excellent reviews: DVR-533H-S (80gb) and DVR-633H-S (160gb). For more information on the DVR-530H-S, visit the official website. For those looking for the manual or user guide (recommended if you want deeper information), you can download it here (note that this is Singapore's version, with USB support). Pioneer Singapore has released new models! Pioneer DVD HDD recorders DVR-340H-S (80GB), DVR-541H-S (160GB), DVR-640H-S (250GB), DVR-645H-S (250GB, HDMI) and DVR-745H-S (400GB, HDMI). Got one of the following above players? Let us know your feedback! Can not record PAL show and play NTSC DVD simultaneously. USB Mass Storage devices are read-only. NOTE: I could be very fussy above - some features may not available in all DVD Recorders - so don't be discouraged by the large number of cons. Click here to view Pictures of the DVR-530H-S / DVR-630H-S in action. NOTE: Some countries countries' models don't have USB support. Last Updated 1st Dec 2006. Unregistered Where I can find its optical unit. My Pioneer DVD Recoder DVR-530H does read-write any more. 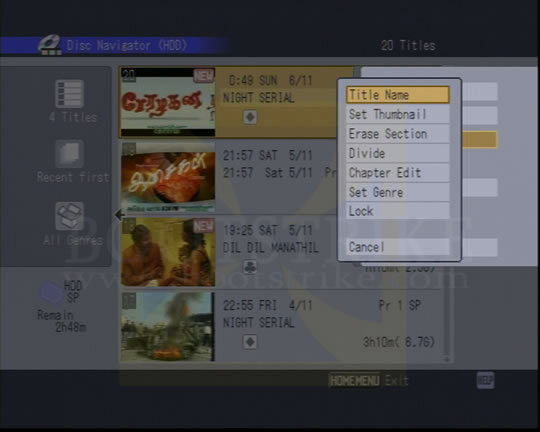 Unregistered But how do you add the chapters to he dvd menu? Unregistered My DVR-530H-S will not copy a title from the HD to DVD. I have tried all types of disks but I keep getting the message 'Please load a recordable disk'. This has frustrated me for years but I still have no idea what I am doing wrong. Any ideas? Unregistered Anonymous: did you ever solve your recording problem HD-DVD as I have had the same issue and can't work out what the problem is!? Rusty Viewer (1 posts) I have the DVR-745H. The problem I have is that the MP3 codecs seem to be old. It won't play some mp3s, others it plays as mono instead of steroo and on a number of songs the sound is distorted. I bought this quite a while after my early model Panasonic DMR-E85 which has much better and consistent MP3 sound quality than the Pioneer. I was hoping it might be fixed with a firmware update but I have found one so far. Shai (2 posts) PS-- RE: RCS77H ..This unit worked for three years but now it won't respond to remote control...and without remote control working there is no way to access or configure the menu..no way to navigate a DVD or CD...so basically it leaves me with few options. HELP! Shai (2 posts) My problem is the Pioneer remote control does not appear to operate the RCS77H home cinema DVD recorder - for example I can not use the arrow keys to select play on the DVD Menu, nor can I press STOP on the remote I have to get up and press the buttons on the player ? Lee in Alexandria,VA Unregistered I've had this unit for more than a year. We like it just fine. It doesn't look up TV programs or provide that functionality, but will burn to CD/DVD and offers the option to select/configure the disk menus on the CD/DVD that you burn. Just be advised, if you save at the slower formats, your disk quality will only be as good as the master. So if you've got low quality playback because you saved your video at one of the slower speeds, the quality of the video once you burn to CD/DVD media will be the same. But that's with any player/recorder. This unit is very straight forward to use and generally wont really require the book to even setup! Great inexpensive purchase with great functionality. I'd buy it again, if the opportunity presented itself!